Clockwise from top left: 1st: View of Bodrum from castle of St.Peter, 2nd: Port Atami, 3rd: A view of Bodrum, 4th: Seaside at Bodrum , 5th: Marina in Bodrum, 6th: Bodrum Castle. 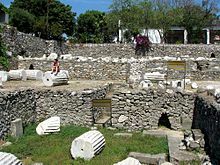 In classical antiquity Bodrum was known as Halicarnassus (ancient Greek: Ἁλικαρνασσός, Turkish: Halikarnas), a major city in ancient Caria. The modern name Bodrum derives from the town's medieval name Petronium, which has its roots in the Hospitaller Castle of St. Peter (see history). Bodrum has a hot-summer Mediterranean climate (Csa in the Köppen climate classification). Winter average is around 15 °C (59 °F) and in the summer 34 °C (93 °F), with very sunny spells. Summers are hot and mostly sunny and winters are mild and humid. "Average swimming pool and sea temperatures for Bodrum". BodrumBulletin. Retrieved 1 March 2015. Halicarnassus (Ancient Greek: Ἁλικαρνᾱσσός, translit. Halikarnassós or Ἀλικαρνασσός Alikarnassós; Turkish: Halikarnas) was an ancient Greek city at the site of modern Bodrum in Turkey. Halicarnassus was founded by Dorian Greeks, and the figures on its coins, such as the head of Medusa, Athena or Poseidon, or the trident, support the statement that the mother cities were Troezen and Argos. The inhabitants appear to have accepted Anthes, a son of Poseidon, as their legendary founder, as mentioned by Strabo, and were proud of the title of Antheadae. The Carian name for Halicarnassus has been tentatively identified with Alosδkarnosδ in inscriptions. At an early period Halicarnassus was a member of the Doric Hexapolis, which included Kos, Cnidus, Lindos, Kameiros and Ialysus; but it was expelled from the league when one of its citizens, Agasicles, took home the prize tripod which he had won in the Triopian games, instead of dedicating it according to custom to the Triopian Apollo. In the early 5th century Halicarnassus was under the sway of Artemisia I of Caria (also known as Artemesia of Halicarnassus ), who made herself famous as a naval commander at the battle of Salamis. Of Pisindalis, her son and successor, little is known; but Lygdamis, the tyrant of Halicarnussus, who next attained power, is notorious for having put to death the poet Panyasis and causing Herodotus, possibly the best known Halicarnassian, to leave his native city (c. 457 BC). Crusader Knights arrived in 1402 and used the remains of the Mausoleum as a quarry to build the still impressively standing Bodrum Castle (Castle of Saint Peter), which is a well-preserved example of the late Crusader architecture in the east Mediterranean. The Knights Hospitaller (Knights of St. John) were given permission to build it by the Ottoman sultan Mehmed I, after Tamerlane had destroyed their previous fortress located in İzmir's inner bay. The castle and its town became known as Petronium, whence the modern name Bodrum derives. In 1522, Suleiman the Magnificent conquered the base of the Crusader knights on the island of Rhodes, who then relocated first briefly to Sicily and later permanently to Malta, leaving the Castle of Saint Peter and Bodrum to the Ottoman Empire. Bodrum was a quiet town of fishermen and sponge divers until the mid-20th century; although, as Mansur points out, the presence of a large community of bilingual Cretan Turks, coupled with the conditions of free trade and access with the islands of the Southern Dodecanese until 1935, made it less provincial. The fact that traditional agriculture was not a very rewarding activity in the rather dry peninsula also prevented the formation of a class of large landowners. Bodrum has no notable history of political or religious extremism either. A first nucleus of intellectuals started to form after the 1950s around the writer Cevat Şakir Kabaağaçlı, who had first come here in exile two decades before and was charmed by the town to the point of adopting the pen name Halikarnas Balıkçısı ('The Fisherman of Halicarnassus'). The population for the town of Bodrum was 35,795 in the 2012 census. The surrounding towns & villages had an additional 100,522, for a total for the province of 136,317. The district of Bodrum is one of 957 in Turkey. It is in Muğla Province which is part of the Aydin Subregion, which, in turn, is part of the Aegean Region. The district includes the municipalities of Bodrum, Turgutreis, Ortakent, Göltürkbükü, Yalıkavak, Gümüşlük, Bitez, Konacık, Yalı and Mumcular. During the 20th century the country's economy was mainly based on fishing and sponge diving. Over the years, tourism became one of the major activities in Bodrum. There are no airports in the city. Two airports serve the city. Milas–Bodrum Airport is located 36 kilometres (22 mi) northeast of Bodrum, with both domestic and international flights.Kos Island International Airport, 70 kilometres (43 mi) to the SW, located in Andimachia, Greece, accessible by boats from Bodrum across a 20 kilometres (12 mi) stretch of the Aegean Sea. Aside from year-round flights to Greek destinations, Kos airport's traffic is seasonal. There is a main bus stop in the city center with transportation to other locations in Turkey. The port has ferries to other nearby Turkish and Greek ports and islands. Julian of Halicarnassus was a bishop in the early 6th century. ^ "Turkey: Registered Population". City Population. Retrieved 2014-04-11. ^ "İl ve İlçelerimize Ait İstatistiki Veriler- Meteoroloji Genel Müdürlüğü". Dmi.gov.tr. 1971-11-30. Archived from the original on 2012-08-01. Retrieved 2012-08-15. Hogarth, David George (1911). "Halicarnassus" . In Chisholm, Hugh (ed.). Encyclopædia Britannica. 12 (11th ed.). Cambridge University Press. p. 837. Chisholm, Hugh, ed. (1911). "Artemisia (daughter of Lygdamis)" . Encyclopædia Britannica. 2 (11th ed.). Cambridge University Press. p. 665. ^ Signe Isager (1998). "The Pride of Halicarnassus" (PDF). Zeitschrift für Papyrologie und Epigraphik, 123 p. 1-23. ^ Fatma Mansur (1972). Bodrum. Brill Publishers. ISBN 90-04-03424-2. 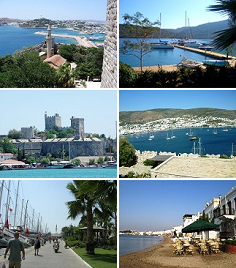 ^ a b "BODRUM | Place to Visit | Things to Do | Famous For". Very Turkey. Retrieved 2014-03-20. ^ "Eskişehir′in kardeş şehirleri" (in Turkish). Eskişehir Metropolitan Municipality Official Site. Archived from the original on 21 February 2015. Retrieved 29 June 2012. Wikimedia Commons has media related to Bodrum.